First of all, it is important to determine which faults in the stove can be rectified by yourself and which cannot be. All types of electric stoves are divided into two main categories – electronic and electromechanical. These both have different scenario of repairing. But here we will discuss some common one. Screwdriver, Wire Cutters, Phase Indicator, Ohmmeter, Control – 100W Electric Lamp in a bag with Connected Wires, Spare Burners. 1. First of all, remove the hob with burners. In most cases, this panel opens like a lid. So, it is enough to unscrew the 2 fixing bolts on the side panels and lift it by the front edge. 2. Having access inside the stove, clean the interior of the dust. But Before this, be sure to disconnect the power cord from the network. You can also use a vacuum cleaner to clear the dust. 3. Carefully inspect the wires from the controllers to the burners. You must replace damaged wires, unusable connectors. To insulate wire connections, use only heat-resistant dielectric tubes. 4. With the help of the phase indicator, make sure that there is voltage in the electrical outlet and with the help of the control device, make sure that the supply circuit is working adequately or not. 5. After cleaning, reconnect the network connector. In this phase check whether the power comes to the controllers of the burners and the oven or not. 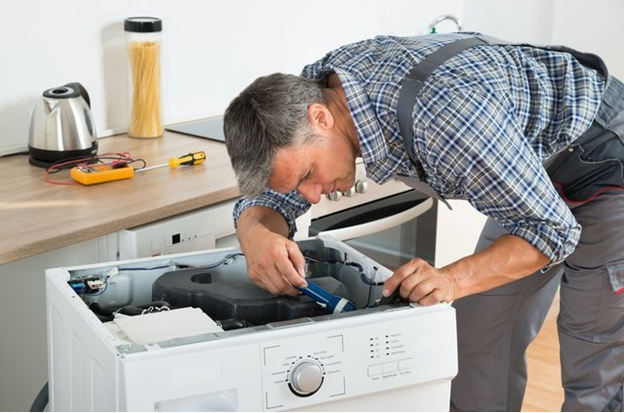 If not, disconnect the appliance and disassemble the power plug. The fault lies either in the plug or in the power cord. Find the unreliable connection and fix it. In the event of a fault in the power cable, replace it with a similar one. 6. Now, when power is supplied to the controllers, turn on each burner mode in turn, and using the phase indicator, make sure that the voltage is applied to the controller outputs. 8. To remove the hob, loosen the central nut, remove the pressure plate from the wires and then remove the hob. 10. Install a new burner in the reverse order. Make sure all connections are secure, only after that, you can assemble the plate. 11. After replacing the burners, calcine the stove by turning them on at full power for 3-5 minutes, so that the preservative oil will evaporate completely. Hope, the above-mentioned points help you in finding the solution for your stove. But, if you found difficulty in self-repairing then hiring Ge Stove Repair Montreal will be a wise decision.